Analyses of the fossilized remains of the jaws and teeth of a shrew discovered in Spain have shown (to be similar but larger to modern forms) (The extant) animal had red teeth, was large in size compared with mammals of the same family, and was more closely related to Asian than European shrews. Morphometric and phylogenetic analyses of the fossilised remains of the jaws and teeth of a shrew discovered in a deposit in Gran Dolina de Atapuerca, in Burgos, have shown this to be an (extant) species (Dolinasorex glyphodon) that has not previously been described. The (giant shrew) had red teeth, was large in size compared with mammals of the same family, and was more closely related to Asian than European shrews. Researchers from the University of Zaragoza (UNIZAR) have discovered fossils in the TD4, TD5 and TD6 levels of the Gran Dolina deposit in Burgos that date to between 780,000 and 900,000 years ago, and have shown that these belong to the ( same family of shrews today) (Dolinasorex glyphodon), from the Soricidae family (small insect-eating mammals). “To date, all the medium to large-sized Soricidae fossils discovered in the deposits of the Sierra de Atapuerca belonged to Beremendia fissidens, a species of plio-pleistocene (layer) shrew that was distributed throughout Europe,” said Juan Rofes, lead author of the study that has been published recently in the Zoological Journal of the Linnean Society and a researcher in the Paleontology Department at the UNIZAR. The morphometric and phylogenetic studies of (this) species reveal a close link with the species of eastern Asia. . .
the body mass of (this greater ancestor) shrew reached 60 grams. The largest today 14 grams its greater ancestor 60 grams. The study of the fossil remains of this mammal has also made it possible to discover that the shrew injected toxic saliva, in the same way that snakes do, via a “narrow and conspicuous channel” located on the inside surface of its lower incisors. 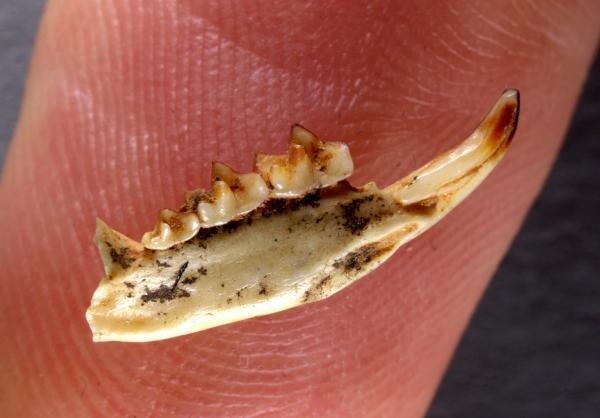 Although the remains of shrews are frequently found in paleontological deposits, their presence is due above all to the feeding habits of birds of prey, which “feed on micro-vertebrates and then regurgitate the skin, hair and bones in conglomerate pellets,” adds the expert. First i would like to say that the largest shrew to ever be found is in the fossil record which demonstrates devolution not evolution. This pattern of declining maturity can be seen and demonstrated by evidence in which there are no exceptions. Shrews in the past reached a higher maturity than do shrews today. The changes shows that shrews shrank in spite of evolutionary just-so stories to the contrary. Evolutionists refuse to see the pattern with all creatures their changes have nothing to do with the environment, heat cold O2 and Co2 enrichment do almost nothing to a creatures size. All of these environments can and have been artificially created and every result is that you cant get there, and that’s because this is a genetic phenomena not a transmutational change from Mother-nature. You would do well to look into these claims of greater ancestry and drop common ancestry.